The 3D Cursor is simply a point in 3D space which can be used for a number of purposes. There are a few methods to position the 3D cursor. Using LMB in the 3D View will place the 3D cursor directly under your mouse pointer. For accuracy you should use two perpendicular orthogonal 3D Views, i.e. any combination of top Numpad7, front Numpad1 and side Numpad3. That way you can control the positioning along two axes in one view and determine depth in the second view. By default the depth of the geometry under the cursor is used, this can be disabled using the Cursor Depth toggle in the User Preferences. The Snap Menu which allows the cursor placement relative to scene objects. 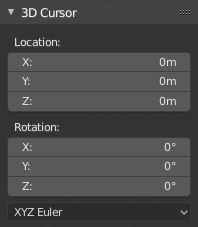 The 3D cursor can also be positioned by editing the location coordinates values in the 3D cursor panel of the properties region. The 3D Cursor is used as the origin for any added object, can be used and moved with the snap tool, and is an option for the pivot point.